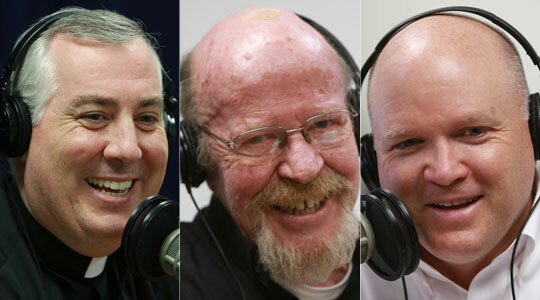 Summary of today’s show: There are several living legends among the priests of the Archdiocese of Boston and Scot Landry and Fr. Mark O’Connell welcome one of them today. Fr. Walter Waldron has been a priest for 48 years and pastor of St. Patrick Parish in Roxbury for 29 years. Fr. Walter tells our listeners about seeing the Second Vatican Council firsthand, putting the lessons of the Council into practice in the inner-city in the 1970s, and then serving a parish that’s like three parishes in one for nearly three decades in a neighborhood many have written off. 1st segment: Scot welcomed everyone to the show and started with the startling news that Fr. Mark was taken by ambulance to the hospital from his rectory yesterday. He fell down a few steps and was taken to the hospital as a precaution.Fr. Mark said the neck brace they put on had four settings: tall, medium, short, and no neck. He was highly insulted that they had it on no neck. Last night, Fr. Mark was able to go to a special Mass at Regina Cleri, where Fr. Bob Oliver is also recovering from an accident and a broken hip. Scot said it’s been a busy week preparing for the live, interactive town hall meeting on CatholicTV Monday night with Cardinal Seán. He said it’s never been done before over all the different media: TV, radio, and the Internet. He encourages everyone to tune in via WQOM or CatholicTV. On Monday’s The Good Catholic Life we will have one of the panelists, Kim Daniels, to talk about how we got to this point. The town hall meeting begins at 8pm. Scot said today’s guest is one of the legends of the priesthood in Boston and he’s been looking forward to this conversation. 2nd segment: Scot and Fr. Mark welcomed Fr. Walter Waldron. Fr. Walter said he grew up in Milton and went to school there. He had two brothers and two sisters. One of the gifts in his life has been his family and extended family. He realizes how much all those cousins mean to him and made him what he is today. His vocation came from his family and the community was very Catholic. He went to St. Agatha School. He wanted to be a lawyer, teacher or priest. He went to BC High and considered being a Jesuit. When Fr. Walter’s father was at BC High in the 1920s and he considered becoming a Jesuit. His grandfather had a work accident that prevented him from working and so his father was counseled he should stay to support his family. So it comes full circle to him. Fr. Walter said Fr. Riley, who was a younger priest in charge of the altar servers at St. Agatha’s, was an influence on his vocation too. He said there were no priests in his family. Fr. Walter said he ended up deciding he would end up encountering more people in the diocesan priesthood than if he joined the Jesuits, who at the time specialized in education. He went to Cardinal O’Connell Seminary for two years out of high school. He went to St. John’s Seminary for two years and then went to the North American College and was ordained in St. Peter’s. He was there in the early Sixties and was there during the death of Pope John XXIII and election of Pope Paul VI. Scot asked what it was like being in Rome during the Second Vatican Council? Fr. Walter said it was very exciting, partly because some of the US bishops stayed in the North American College and had interaction with the seminarians. Some seminarians were even able to sneak into the sessions in St. Peter’s. He and his classmates were on the side of those who were most forward-looking. During his time in Rome, he wasn’t able to come back from Rome, but his family did come visit once before ordination. He took a ship over with the other seminarians. He recalled how the seminarians were all seasick at first, but he loved it so much that he came back by boat rather than fly. Scot asked Fr. Walter is he learned the old and the new liturgies. He said he was trained in the older missal. There was no transition while he was there. Fr. Walter was ordained in 1964 and has had only three assignments in those 48 years. He was first assigned to St. Margaret in Beverly Farms. He remembers saying to the people that first Sunday, “I’m so glad to be here in Beverly Hills.” He was there for two years. Then he was a parochial vicar at the Cathedral of the Holy Cross for 18 years. He had asked Cardinal Cushing to be assigned to work in the city and to live in an apartment among the people. Cardinal Cushing said no, but offered him a position at the cathedral. He made many friendships and is still involved with some of the groups from them. He loved living in the city and came to learn the movement of the city. He has remained in the city, going to St. Patrick’s parish in Roxbury in 1984. Fr. Walter wanted to live in the city because of the priests he knew in Roxbury at the time. He liked the life they lived and how they had freedom to interact with people. He talked about how he was mentored and affirmed by Msgr. Russ Collins. Fr. Mark said the monsignor was a real innovator in our archdiocese. He helped form a group called the Boston Urban Association of Priests. They were very vocal about public policy and even endorsed a candidate. They thought they were reading the signs of the times. Scot said it was a tumultuous time in Boston with the busing crisis. Fr. Walter said it gave him an identity with the people that were there. He came to understand their difficulties and pain and how far they felt from the mainstream of Boston. It was an eye-opener for him. Scot noted that the Boston Urban Priests helped the Pine Street Inn form itself. Fr. Walter said there was a place called the Dawes Hotel that was pulling out of the business of serving the poor, and no one wanted to take over the ministry. They took over the place and re-named it the Pine Street Inn. They didn’t know they were supposed to ask the cardinal first. They had some advisors on how to help people who were addicted to alcohol. They had only one employee and each priest would take a night to be there. Scot perceives that time as a time for the Church asking herself what she was to be in this town and in this world. What do the condiments of Vatican II mean in practical matters? There was a lot of adjustment. Fr. Walter said there wasn’t a model to follow. Fr. Walter at the time took on a foster kid and moved out of the rectory into an apartment. He was then called in by Cardinal Medeiros. He told Fr. Walter that he knows what he did and only wanted to know that he was taking good care of him. He had the foster kid for four years. Scot asked what it was like to move to St. Patrick’s in 1984. He didn’t want to move out of the cathedral after being there so long. In fact, he’d just been asked to be the chaplain at Walpole State Prison and he said no because it would be the same population day after day. So when St. Patrick came up, he took it. He’s attracted to variety in his priestly ministry. Scot said you couldn’t get more variety in St. Patrick’s. Fr. Walter said they just celebrated their 175th anniversary. They had three languages: English, Spanish, and Portuguese Creole. He feels like he’s already in charge of three parishes. In 1989, the Boston Globe did a big three-page article on him in the newspaper. It showed how he had a presence on the streets, a consistent presence over a period of time. After a while he wasn’t a stranger there and people came to know he was interested in all communities. He showed how they could come together as one parish with three communities. Fr. Walter said for a long time they had three parish councils. He didn’t think it made sense o he established a supercouncil. After a while they formed one parish pastoral councils for the last 5 to 10 years. It’s helped him to learn better the other language groups, to know them on a personal and a professional Catholic level. Scot said half of the parish are newcomers to the country. 85% of all parishioners are from Cape Verde. He said much of the ministry must be helping people adjust. Fr. Walter said the question has been whether to focus on people’s background and culture or do you try to acculturate them? They’ve found a balance. They’ve been able to do a lot of outreach in the native languages, mainly through a lot of sisters who spoke the language. There’s a commonality between the pastoral staff and the people who came here. Cape Verde is traditionally Catholic and so there’s no difficulty in attracting them to the Church. Like in the past, so much of their lives focus on the Church. Fr. Mark asked if the Church is sanctuary. Fr. Walter said “sanctuary” is a loaded word, but Fr. Mark said he didn’t intend it that way. Fr. Walter said they’ve always had good relationships with civil authorities. He’s never been faced with a person asking for sanctuary from immigration issues. Scot said growing up, Roxbury was never portrayed in a positive light in the news. He asked Fr. Walter to describe it. He said it is home for people. He tells priests that they have to come in recognizing that they are people just like you. People are sometimes afraid to come to Roxbury, but he encourages them to come. He said the safest part of the city on a Sunday morning is Roxbury because everybody’s in church. It’s hard to drive the image of the shootings in the street from people’s minds. But it’s not an everyday occurrence. There are people who are interested in raising their kids, keeping their homes neat, and living their lives. Fr. Mark said he regularly says Mass with the Carmelite Sisters in Dudley Square. Fr. Walter calls them the spiritual powerhouse. He’d never before met cloistered sisters, but he found them to be just like the rest of us. He said a number of religious orders work with St. Patrick’s so they make a big deal in February for World Consecrated Life Day. Now they have the Franciscans of the Primitive Observance in the parish. Fr. Walter said their desire is to live a life as close as possible to St. Francis’ life 800 years ago. They wear a rough habit, they sleep on the floor, they eat only what they’ve begged that day. They are very good at reaching out to others. They’ve only been there two year,s but everyone knows them. Fr. Walter said they are living in one of their buildings, but have a broader vision than the parish. Several of them have learned Creole in order to say Mass and do confessions in the language of the people. When they first came they came over the parish to offer to help. They’ve established a monthly holy hour for vocations to the priesthood. One of the brothers of the FPO is being ordained to the priesthood tomorrow. Br. Michael Sheehan will be ordained by Cardinal Seán at the Cathedral. After the Mass, they will have a reception at St. Patrick’s. He will continue doing the work of the order in the community. Fr. Walter said they are like worker-priests whose work is for the advancement of the Church, being out where the people are and making sure there’s a normal interaction with them. They are concerned the people are not only Catholic in name, but in practice too.They want the folks to see the Church as an essential part of their lives. Scot asked what is one of his biggest joys as a priest. Fr. Walter said being a priest and being fortunate to be in a life he just loves. He loves it as much today as he did the day he was ordained in St. Peter’s. He said he’s heard stories of priests burdened by the stress of their priesthood. He doesn’t recall a moment he felt that way. He said it’s the joy of being with the people and being astounded at how they take him into their homes and family. He remembers a couple of years ago after some surgery and seeing how concerned the people were for him. Scot said we tend to think of John the Baptist as preparing for way of the Lord during Advent, but we should think of him at all times because he’s always pointing us to Jesus. Fr. Walter said he was an evangelizer and it’s believed to have belonged to a spiritual sect of Judaism that was looking to reinvigorate the faith for the coming of the Messiah. Fr. Walter said it is traditional in Judaism for a boy to be named after the father or an ancestor. But we don’t know why Zecharaiah wanted to name him John. It shows the importance of names in Scripture. Jesus renamed Peter, Saul was renamed Paul. Fr. Walter said this is true today. It’s common for recovering addicts to give up the name they used while they active, they went back to their real name or a nickname they had as a kid. Scot said Popes take on a new name. Cardinal Seán grew up as Patrick O’Malley, but took on the name Seán when he became a religious. Fr. Mark said he was struck that John is about humility and his birth, which references much of the Old Testament, has lots of triumphant images. In the Gospel, John says that he must decrease while Christ increases. He was humble and our Lord was heralded through humility. Scot related that Zechariah couldn’t speak because he doubted the news from the angel Gabriel that he and his wife would have a son in their old age. Scot said the entirety of John’s life pointed to Christ.